The architecture of resort hotels is almost never any good, and in a way it makes sense. You’re supposed to spend time outdoors, so why lard up the rooms with features people actually enjoy, like natural light and screens against nosy neighbors? Still, there’s something to be said for a humanely designed lodging (beyond the free soap samples), especially for those of us who don’t feel the need to sit out all day, frying ourselves to a crisp. Amsterdam-based NL Architects wants to create precisely that with an inventive new hotel in southern China. At first glimpse, the design for the proposed Sanya Block 5 at the International Recreational, Leisure and Health Resort in Sanya, China, looks like your standard mega-resort atrocity: It’s got eight monolithic beige buildings arranged in pairs like a double-strand necklace, each six-stories tall and each identical to the next. Not terribly enticing. But with a handful of design tweaks, it improves upon the old formula in key ways. The biggest move is labyrinth of catwalks that links individual rooms to a central elevator core and stairwell in each pair of buildings. 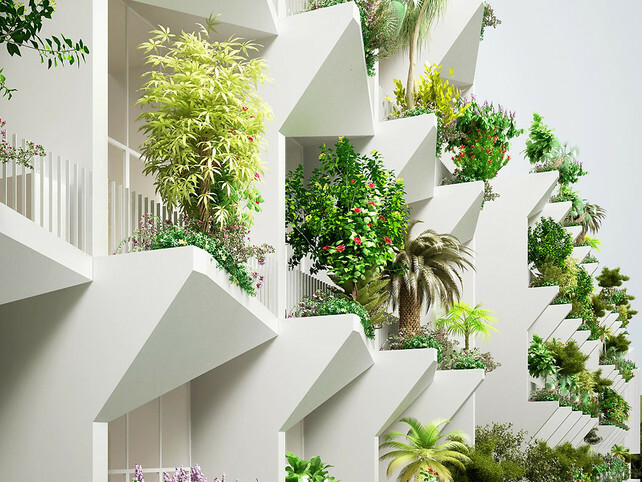 The architects call it a “3-D bridge system.” So instead of shuffling down an endless corridor of rooms to get to your room–the standard circulation pattern in almost every hotel–you follow a private pathway, which leads directly to your front door. That means you arrive at your room faster–and enjoy greater seclusion from other guests, to boot. As for the rooms: Each is spread over two levels to create a double-height living room with floor-to-ceiling glass. A wall separates the living room from the bedrooms and bathrooms, giving residents privacy where they need it most. Sanya has a lush, tropical climate–the daily mean temperature is 25 degrees Celsius (about 77 degrees F)–so NL Architects wanted to obscure the divide between the indoors and the outdoors. Each room has a balcony complete with an open-air kitchen; a built-in flower pot that’s deep enough to grow trees; and–get this–a hot tub and shower. Va va voom! There’s another reason why those private catwalks come in handy.